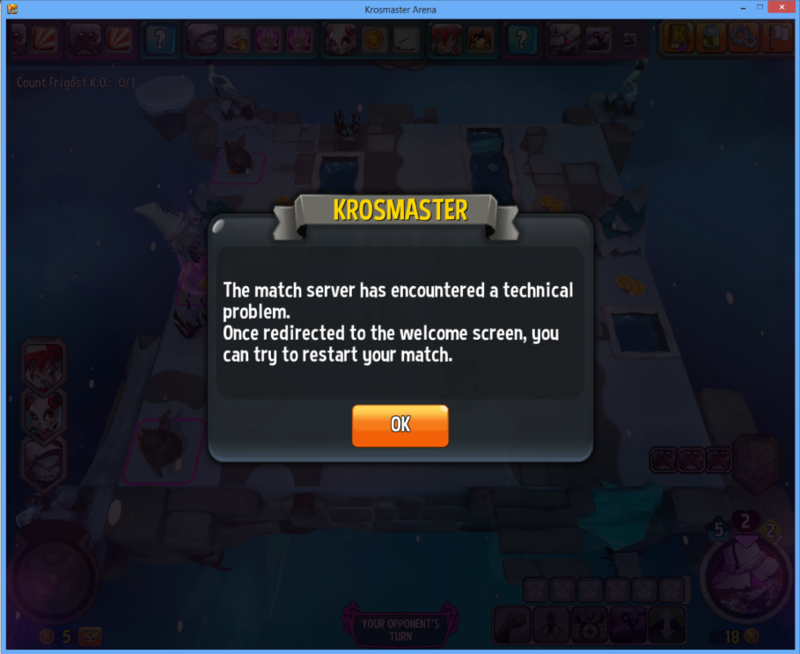 A technical problem in Adventure mode - FORUM KROSMASTER : Forum dedicated to discussions about Krosmaster. Share all your opinions, ideas and tactical tips! after which I have to restart the entire mission regardless of how much time was spent. Bug's description: Again, I encounter the message: "The match server has encountered a technical problem". Afterwards I have to redo the mission losing all the mission's progress. I also want to note that this is not the 1st time I've encountered this problem, it occured randomly before at different maps with different figures. How to reproduce: Not really sure how. 2 months have passed since I've reported this bug (both to this forum and to support), but seems this hasn't been fixed at all. Again, whenever I encounter this problem I have to redo the mission completely, which is very frustrating, especially when I'm only 1 step from winning. I am seeing this error as well currently. I am unable to complete any adventure missions. It seems like our servers had a few problems the other day, which might explain an impossibility to finish any adventure mission. We expect this problem to be temporary. However, if it persist, can you give us a log of your error? (F3 on the updater) Maybe we will be able to find another cause to this problem. Hi, even today the problem still persists, I am getting the same massage in the middle of a mission.